Article first published as Chili And Cheese Macaroni on Blogcritics. I came across the recipe for 'Chili Mac' in a Cook's Illustrated Make Ahead Recipes magazine and knew it was a dish I needed to make. It had all the food groups represented - meat, dairy, vegetable, grain. There was no question this would be a great recipe after reading it through, but I did adapt slightly. I reduced the amount of chili powder used to cut down on the spice. I also incorporated more cheese for a better balance of chili flavor and creamy cheese throughout the dish. The end result is a great version of mac & cheese. It was even enjoyed by my son (once pureed). Stir in the cooked pasta, 1/2 cup of shredded cheese and season with salt and pepper to taste. Transfer mixture to a 9x13 baking dish and smooth over with a spatula. Bake in the preheated oven for 30-35 minutes or until the mixture is hot and bubbling. I am trying your mac and cheese recipe today, changing it slightly by taking out the beef and going with turkey. I think it will still be awesome and thanks so much for posting your recipe. 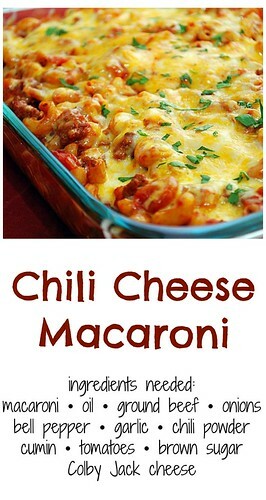 OMG Mac and Cheese with Chili sounds like the perfect combo! It was good even with the changes I made: celery for onions, veggie burger for beef, added little amt of gravy I had, added chopped carrots, & but chili in 1/2. Still great. Ate it for lunch & have way too much left....only 2 of us! It was finger lickin' good! I have to get away from your blog. I am inhaling the calories. This is calling my name. MMM!!! I have two men in my household who would devour this plate and beg for seconds. Lovely photo to go along with it. Well done!! You seriously can not have too many mac 'n cheese recipes. This one looks amazing! 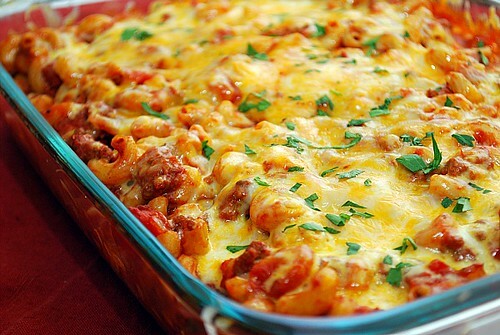 Chili, cheese, macaroons..this sounds great and looks incredibly delicious! Perfect recipe! Thanks for sharing. My boyfriend has made this for us twice now--so good! I especially love the colby jack cheese on it! This was a big hit with my children and grandchildren. Delicious and a keeper. Added some paprika and crushed red pepper, and only used 1 lb of ground beef. It's really, really good! If you have picky little ones, this is the dish to make! Let me just say, my kids both asked for seconds! They wanted the leftovers for lunch the next day! I'm thrilled when I find a recipe that they will eat - but I enjoyed it too! I don't know how I even ended up on your blog, but happy I did! This is comfort food at its finest, but I decided to make it like another poster did with just a pound of beef and it was great...no one complained. Wowzer..that is some of the best looking stuff I have ever seen in my entire life....thanks so very much for sharing! Found your recipe on pinterest & tried it tonight. Everyone loved it, except for one thing - it was too watery. I'm wondering what you mean by 'crushed tomatoes'?I wasn't sure what you meant & they don't have something like that in the store. I made the assumption that you might mean stewed tomatoes, crushed. So that's what I used,but I'm wondering if that's what the problem was, because there was so much liquid in the stewed tomatoes, that I shouldn't have added the pasta water & it would've been perfect. Either way, we liked it & ill make it again - but just wondering what you meant so I know next time! Thanks! Sorry I'm anonymous, can't sign in under anything here. I made this for the first time and added a little cream cheese into the mix before putting it into the oven... delicious recipe that I will make many times over! Thank you!! Looks delicious! It's going to be one of the first new recipes I try in 2013. Thank you!!! Can i omit the sugar? its the only thing im missing! @Edith - you can certain leave out the brown sugar! Where's the chili for this recipe? How much chili do we add to this. I'm not putting brown sugar in this. @Laquicia - the recipe above is for the chili to mix with the macaroni. And feel free to omit the brown sugar if you'd like - the 1 tablespoon brown sugar noted in the recipe only adds a hint of sweetness and it can be omitted. I am just awaiting the oven to heat up ready to put this in to cook. May I ask what the cheese is you use, as I live on a Canary Island and have never Heard of the cheese, please can you give me a description thanks. I am using all my left over pasta and macaroni, I also had some Quorn left in the freezer, so am awaiting the end results, I have not used as much chilli and cumin as I am not making as much in quantity. I shall repost once cooked and eaten..It is smelling yummy already. The reason for adding sugar to a tomato recipe is to cut back on the acidity of the tomatoes. 1 Tablespoon of brown sugar isn't really enough for you to taste the sweetness. I haven't made this yet but it sounds delicious. Will be giving it a try, but will freeze half to give to my college student grandchildren. I'm sure it will freeze fine. I have frozen similar recipes with no problem.